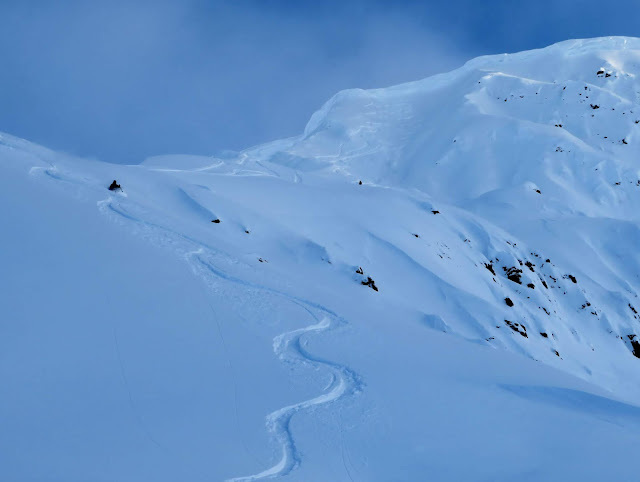 Thurs – Fri: cloudy to clearing, cool, wind in favored terrain (high confidence). Clouds tomorrow, especially near the Prince William Sound, where snow will also fall. Expect warming and clearing into Friday with cold nights. There will be some wind tonight/tomorrow along the Anchorage Front Range, Turnagain Arm, Whittier, and Seward. Weekend: sunny, warm days, cool nights, calm (high confidence). Dry weather will be well established over our region. With strong spring sun and clear nights, afternoons will be warm and mornings will be cold. The sun will have a strong impact on solar aspects, while high north aspects will harbor cold snow. Early Next Week: cloudy to clearing, snow showers possible, warm (moderate confidence). 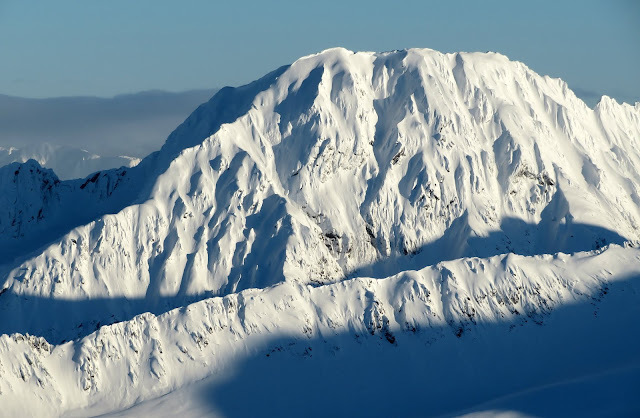 Southcentral will be on the edge of a storm in western Alaska on Monday. As such, clouds to light snow are possible. When the sun comes out expect immediate warming and solar impact to snow. The idea for Boisterous came on a cold ride to the Knik Glacier with Jessy and Khalial. Looking south thru wisps of woodstove smoke, we could see the fuzzy outline of a king line at the back of Hunter Creek. Since then, its been a weather and stability waiting game; finally everything lined up in late March. 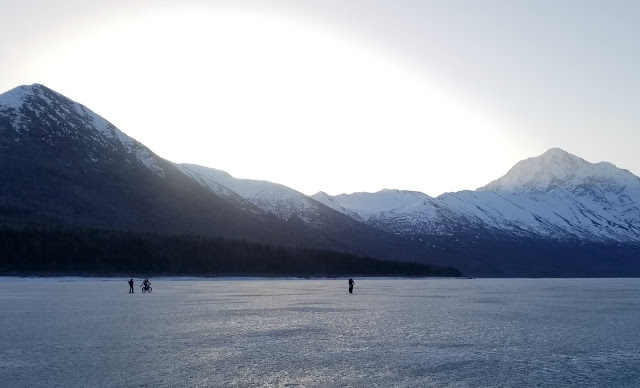 The day started with five miles of fatbike-skijoring across Eklutla Lake. 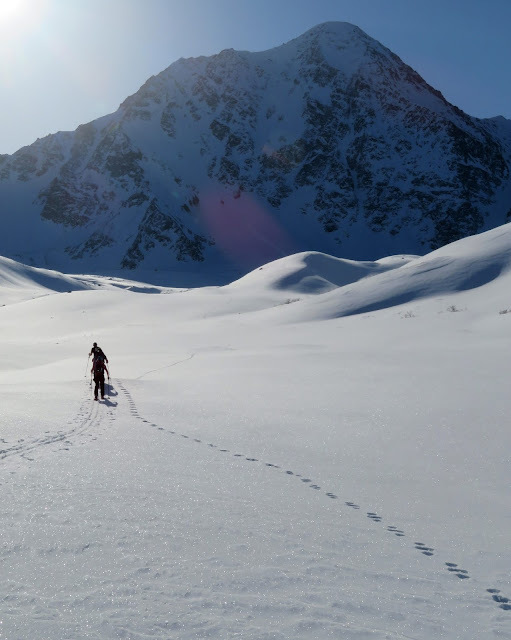 Under the huge north face of Bold, we followed wolverine tracks towards Hunter Pass. On its endless search for food, the roving phantom had stopped to look under every rock. Updated 4.20.2019 to include another great day in Falls Creek. Around 2 PM on Saturday the texts starting coming in from Jeff: he and Jeebs were storm skiing untracked pow in Falls Creek. I was sitting in gloomy, windy, and rainy Anchorage mourning getting shut down on the Alaska Range by storm after storm. The forecast was calling for more of the same Saturday night into Sunday, and I wasn't going to miss out on more stormy couloirs. The next day, hiking out of the rainy parking lot in our running shoes, it was hard to imagine winter was up there somewhere. But, by the time Andrew, Alex, and I had climbed past a sleepy black bear, traded our running shoes for ski boots, and skinned into the alpine, winter was back in full force. 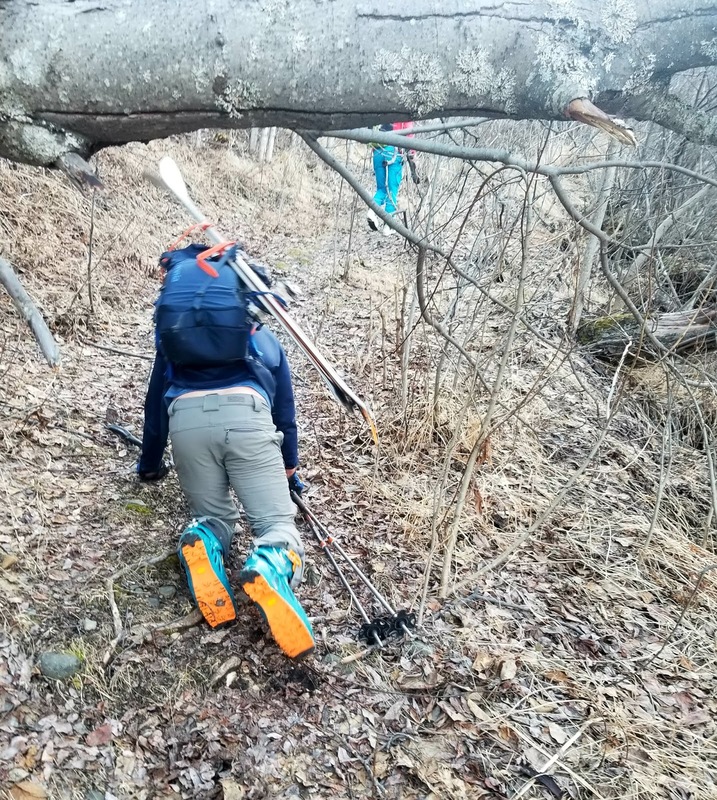 Making a right turn, throwing our skis on our packs, and starting the booter up the first coolie of the day, we began to realize just how good it was going to be. From the top I looked back down at Andrew as the falling snow swirled out of sight below. Alex ski cut the slope before dropping first. After a foot of rapid loading overnight, we weren't sure how the new snow had bonded, but nothing moved. February brought weeks of intense nerve pain and the slow loss of sanity. By the end of the month cabin fever was a bigger risk to my mental health than the outdoors were to my physical health. 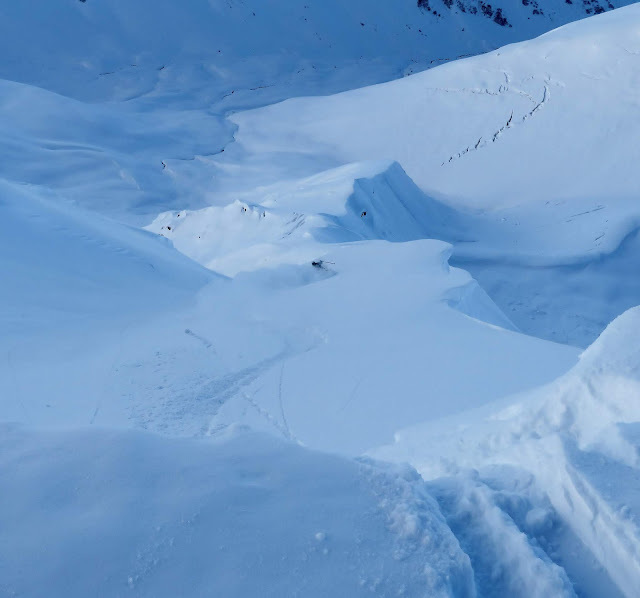 But, where to go skiing? While clicking away at work an old suggestion floated into my head from somewhere in the cosmos: Mount Andy Simons. Southcentral had been crushed by gap winds, maybe it was far enough out of the corridor to be sheltered? We were stoked to check out something new, so drove south to give it a go. The three mile approach to Ptarmigan Lake went quickly and we were soaking up vitamin D on the lake. Looking east across the lake towards even fatter zones by Nellie Juan. Maybe someday I'll own a little piece of mountain paradise in Moose Pass. On the far side of the lake we waded back into the alders and towards the obvious slide-path/gully/terrain-trap. None of us were sure what to expect, but could see blue water ice in our intended route. Within a couple hundred yards the alders were obliterated by avy debris, and then we clambered around the series of small ice bulges. Next was wallowing up the rest of the gully until we could skin into the upper basin. Alaska is the land of feast or famine. November brought days of rain, rain, rain to the Kenai Mountains. Fortunately, days of rain at the road mean feet of snow in the alpine, and in early December we finally got the weather window we'd been waiting for. Not entirely sure about stability and snow, we started with a long, protected spine towards Bertha Creek. Jono offered to go first; we could barely see him through the trail of cold smoke he left behind. It was going to be a good day. Playing leapfrog down the long spine, I looked up to see a partially submerged Bucky. He'd later say this was the deepest day he's ever skied in the alpine.